The Chinese Silver Panda coins are silver bullion coins that are minted each year in China. The artwork is redesigned annually, and many coin collectors and investors anticipate the coin’s release each year. Panda coins are minted in several different weights and denominations, from only a half troy ounce to 1 kilogram. 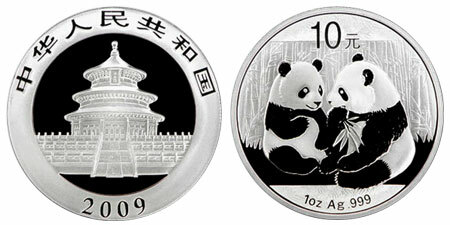 The Chinese Silver Pandas are issued by the People’s Republic of China and are the official coin of the country. These treasured silver bullion coins are prized the world around and represent stability and growth for the people of China. Chinese Silver Pandas are a popular investment silver bullion coin and are not only considered a valuable investment, but a collectable coin known for its artistic attractiveness. This yearly issued bullion coin in China is the country’s most famous coinage, as the panda is a unique and rare animal and revered as a national treasure in China. The playful black and white furred panda bear has deep black eyes and an entertaining personality. The panda has been known for its vulnerability to extinction. Chinese Panda Silver coins were first minted in 1982 and were first available in weights of 1/20 oz, 1/4 oz, 1/2 oz, and 1 oz. From 1982 to 1985, the coins were proof quality with a silver content of 90%. The coins were once again minted in 1987 and although still proof quality, they had a silver content of 92.5%. Since 1989, all Chinese Panda Silver coins are bullion grade with a silver content of 99.9%. They are minted in additional sizes of 5oz, 12 oz, and 1 kilogram. The artwork on both the front and back of the coin is changed every year. The front is always of a Panda in its natural setting. Chinese Silver Panda coins were first minted in Shanghai, China and after they became popular, they expanded production in the 1990s to mints in Shenzhen and Shenyang. The Chinese Silver Panda has gained such momentum in sales and demand that the Chinese mints have increased the production of these silver bullion coins to meet the need. However, in 2006, unscrupulous counterfeiters duplicated these coins and a large number were circulated among the authentic ones. The way to identify a counterfeit coin is the missing denomination. None of the fake Chinese Silver Panda coins were minted with a face value on them—a helpful mistake for those wishing to purchase these bullion coins. Chinese Silver Pandas have always been adorned with the beloved Panda on the front and the 2013 issue portrays three pandas drinking from a peaceful pond with bamboo behind them—their favorite meal. The reverse of the coin always features an image of the Tian Tan, the Temple of Heaven located in Beijing. The mint in China does not include a mintmark to indicate which mint the coins are from, but it is possible to figure out the mint at times by subtle differences seen on each coin. The Chinese Silver Panda coin has won the hearts of the Chinese people and collectors around the world. So much so that the total minting in 2011 was 6,000,000 compared to 275,000 in 1989.